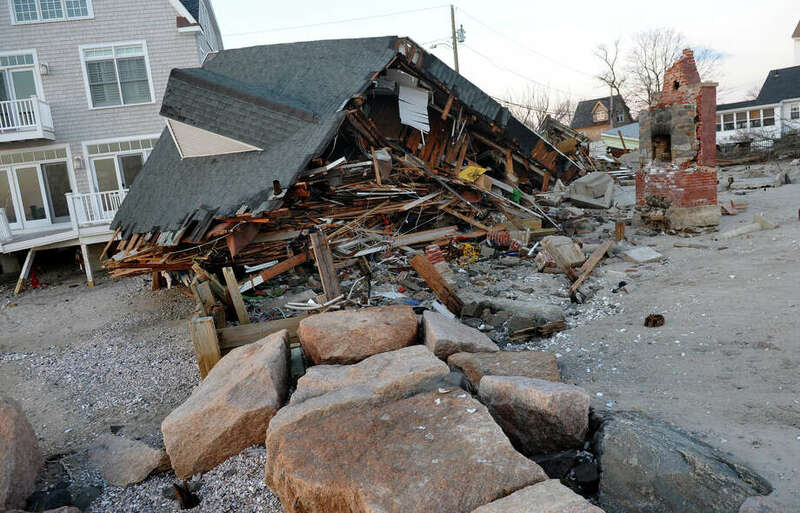 This home on Fairfield Beach Road was destroyed by Sandy. While town crews continue to collect the downed trees and waterlogged furniture left in Hurricane Sandy's wake, it is also collecting receipts and data needed to apply to the Federal Emergency Management Agency for reimbursement of storm-cleanup expenses. "There are no numbers," Robert Mayer, the chief of staff for First Selectman Michael Tetreau and the town's acting fiscal officer, told the Board of Finance on Tuesday night. "The town is taking every effort to make sure we are compiling what's needed for FEMA reimbursements." Among the larger repair projects confronting the town are damage to the Penfield Pavilion, Fairfield Beach Road, Southport Beach, the Pequot Avenue bridge and several tide gates. Asked about insurance coverage for the buildings, Mayer said he did not know the details of what the town's insurance policy will cover. However, Caitlin Bosse, interim finance board clerk, said under the town's umbrella policy, there is a $500,000 deductible for buildings in the flood zone, such as Penfield Pavilion. "We need to make sure we have a point person ... a contact person on staff or outside" familiar with FEMA regulations, Chairman Thomas Flynn said. Finance board member James Walsh suggested there are people, especially in southern states, who have retired from FEMA and work as consultants. He asked Mayer if he, for now, is the town's point person for FEMA. "No, I'm not," Mayer said, adding the Finance Department has not had a role in the FEMA process in the past. "So, as fiscal officer or chief of staff, you're not officially in charge?" Walsh said, adding this is an "area ripe for things to fall between the cracks." For several years now, the contracts manager in the Department of Public Works has been in charge of compiling and submitting the town's FEMA reimbursement requests and, prior to Hurricane Sandy's arrival, sent out an email reminding town employees of the information that needs to submitted with its application. Flynn also asked what happens to the property assessments of homes that were destroyed in the beach area. Tetreau said he did not know at this time, but Walsh said the town has an annual appeals process in place for changes in a property's value. "All these people can apply," he said, to have their assessments adjusted. "If people feel they have been affected they should apply." He noted that the appeal hearings are held in March of each year. Finance board member Chris DeWitt expressed surprise and disappointment that there was not firm data or numbers regarding storm costs for the board's review, but Tetreau replied, "The storm finished last Thursday."